Garden of Aaron: Balloons in the Garden! Balloon flower buds. You can see where the plant got its name. OK, actually it's Balloon Flower (a.k.a. Platycodon grandiflorus). - It can grow 18-36 inches tall. I'd say none of mine are over 12-inches at the moment and one that I planted this spring is blooming even though it's only about 6-inches tall. But the one that I planted last autumn is much taller this year than last, so I'm guessing it gets bigger and bushier as the plant gets older. 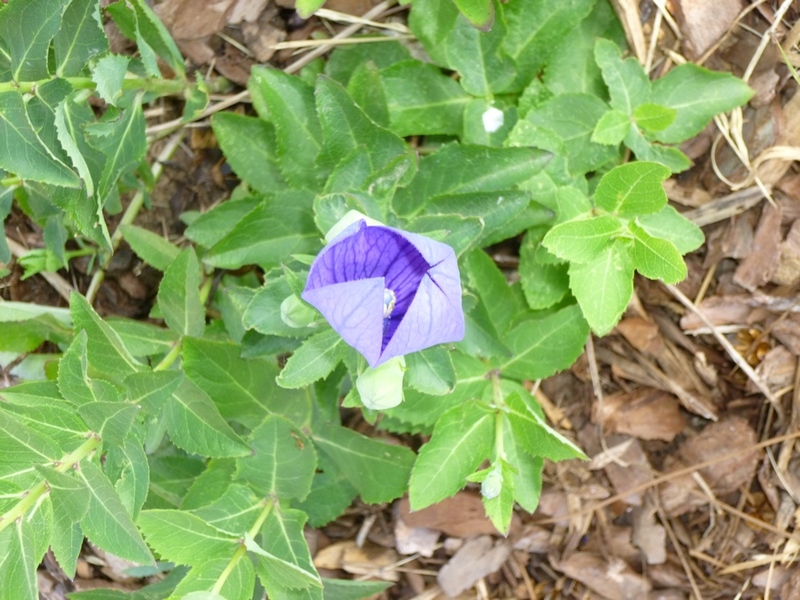 Balloon Flower just beginning to open. - It has a tap root that makes it drought-tolerant, but that means it dislikes being transplanted or divided. In other words, just put it where you want it and leave it alone to do its thing. - Reportedly it prefers well-drained soil, but ours are doing well in semi-amended clay. - The plant is herbaceous. It dies to the ground in winter and is a little slow to emerge in the spring. I can't recall exactly when it emerged, but I do remember I was worried as to whether it would ever reappear. You may want to mark the spot where it's sitting dormant underground so you don't accidentally dig it up if you are planting in that bed in the spring. And here's a fully-opened Balloon Flower! - The plant is supposed to bloom for 4-8 weeks starting in early summer. Sure enough, two of our three balloon flowers started blooming around May 24th. I'll try to post an update later to let you know whether they did indeed bloom throughout June and July. Some sources say that cutting the plant back to the ground when blooms cease may prompt regrowth and an autumn rebloom. I might try that. - Some sources say the flowers are supposed to attract butterflies. Sadly, I have not yet seen butterflies (or any other pollinators) on our balloon flowers. - Kitazawa says that the plant is known in Japan as "Toraji" and that the root is eaten there fresh or dried and valued for its medicinal anti-inflammatory properties. I have not tried that so I cannot vouch for the accuracy of those claims. 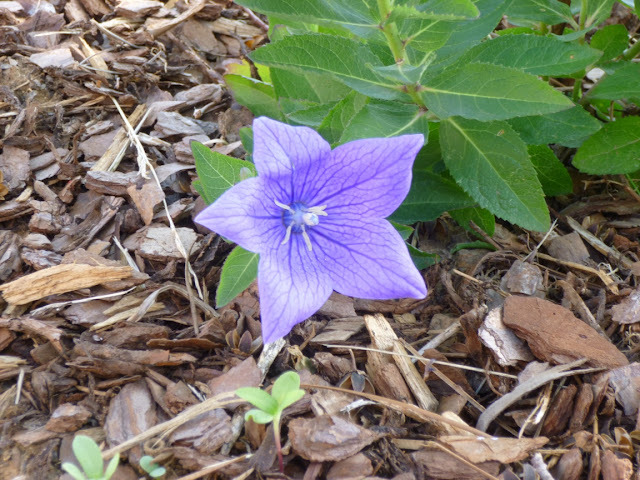 - Bountiful Gardens says Platycodon is used in teas and syrups for coughs, and for soups and salads as a medicinal food. Again, I cannot vouch for the accuracy of this claim and would suggest that you refrain from consuming any part of Platycodon unless you can find proof to your own satisfaction that portions of the plant are safe to ingest. - Update 6/10 5 p.m.: Want to hear something really confusing? Near as I can tell (from Wikipedia and other sources), the Koreans also eat the root of Platycodon grandiflorus and they call the root "doraji". 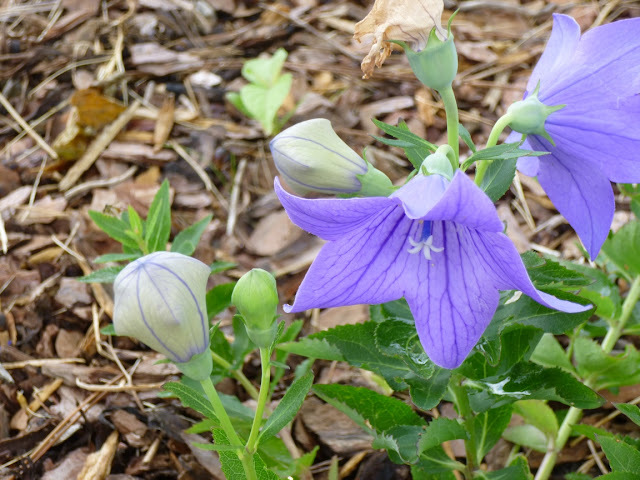 But there is also an unrelated Korean Bellflower also called "doraji"! No idea whether the roots of that 'other' doraji are edible. That's why it's best to use Latin names when talking about plants - particularly plants you're thinking about eating - to make sure you don't confuse an edible plant with a toxic one that happens to have the same common name. In any case, personally, I don't have any plans to try eating Platycodon grandiflorus or using it medicinally. First of all, the medicinal benefits sound unconvincing. Second, some sources list Platycodon as being toxic - at least the basal foliage and perhaps the root too!? Finally, the preparation process to render doraji edible sounds arduous and lengthy for a dish described as having a taste that is not "particularly pleasurable". In short, I think I'll continue to think of Platycodon strictly as an ornamental plant for now. - Some sources say that Platycodon may self-sow politely. I have not seen any evidence of that yet, but I'd certainly be happy to get some volunteers. Overall, I've found this to be a lovely plant so far. It seems very tough and trouble-free. The foliage looks great - so far I have not had any issues with pests or diseases. The buds are lots of fun as they swell into their balloon shape and the flower is beautiful when it does unfold. I'd say the self-cleaning flowers last for the better part of a week. In conclusion, I wish the plant offered more wildlife benefits for bees, butterflies or birds, but from an aesthetic (and perhaps medicinal/edible standpoint), it's certainly a nice plant that I think could and should be used by more gardeners looking for a charming and reliable perennial. I've seen them reseed real well on a steep slope. My balloon flowers have seeded around a little bit. I'm hoping to get more seedlings this year after I let the seedheads stand on the plants over the winter and tried scattering them around a bit. Based on your comment, I may try buying and planting a couple more on the top of a steep slope that I have to see if I can get them to seed in.